Last week I posted about a new waterproof Kindle Paperwhite from a company called Waterfi. They were nice enough to lend me one for review, so I did some tests to see if it really is waterproof. On the surface the waterproof Kindle Paperwhite looks exactly the same as my regular Kindle Paperwhite. There’s no visible coating over the screen or anywhere else. All the waterproofing is done internally, so on the outside both devices look identical. The one way to tell the waterproof Kindle from the regular one is the power button is stiff on the Waterfi Kindle as part of the waterproofing process. This makes it a little more difficult to turn on and off, but you just have to press the button harder, and the sleep cover magnets still work like normal. The only other difference is the waterproof Kindle feels slightly heavier with the waterproofing material inside, but the difference is negligible. I did some initial tests by putting the Waterfi Kindle in a Tupperware container with a couple of inches of water. The first time it was rather difficult to do because it just seems so counterintuitive to put a Kindle or any electronic gadget underwater, but I went ahead with it and was surprised to find the Kindle actually working underwater, frontlight on and everything. One thing I discovered is that the capacitive touchscreen doesn’t work underwater, so you can’t actually interact with the device. Once you dry off the screen the touchscreen works fine. After my initial tests of dipping the waterproof Kindle underwater several times, and rinsing it off with running water, and even after sticking it in my grandma’s fish tank just for the fun of it, everything continued to work fine on the Waterfi Kindle for a couple of days. Then I decided to find out how waterproof it really is, but I think I may have taken the tests too far because there was one unfortunate side effect. I wanted to see if the device could remain underwater for extended periods of time. I decided to leave the Waterfi Kindle submerged in a tub of water overnight. Much to my surprise, after spending several hours underwater, the waterproof Kindle still worked fine without any sign of trouble. I then put together the video review below, and everything was still going fine, but then soon after that the frontlight started flickering, which is weird because it was working fine after sitting in a tub of water overnight. So at the end of this review the Kindle itself still works fine, but the frontlight is broken. It has stopped flickering and is now off completely. The device works and even charges like normal, but it doesn’t seem that the frontlight is as waterproof as the Kindle is. Of course I took testing to the extreme. The device, although waterproof, isn’t meant to be stored or used underwater. Under ordinary circumstances—reading in a bathtub, hot tub, sauna, the pool, the rain, while boating, etc—I think the Waterfi Kindle would work just fine. The Waterproof Kindle Paperwhite costs about $100 more than a regular Kindle Paperwhite and can be ordered from Waterfi.com. But didn’t you say that you can’t use the device if the screen is wet? So, you can read in the pool as long as you just re-read the same page over and over? 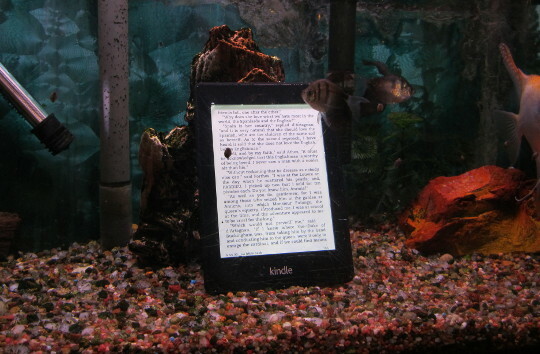 Only if you plan on reading while underwater. If there are splashes or drops of water on the screen the touchscreen will generally respond, just not while it’s submerged. Oh that’s no fun! I wanted to read at the bottom of a pool with a long snorkel. I’m looking for a device i could take u derwater with me. When you go diving, yoh can have fairly long deco stops and I thought I could make a better use of my time witb a waterproof kindle! However, I understand you don t recommend it for diving, correct? Alternatively, maybe you know a similar device i could take underwater with me? Yeah, this definitely wouldn’t cut it. It’s more water protection that waterproof. I don’t know of any devices you can use regularly underwater, most are like this and are more for water protection. But I’m sure there’s something out there. It looks like a nice product, however after Waterfi charged my card, I was informed that my order would be kept on hold and after that I haven’t heard from them.